There is, perhaps, no other creature in the deep sea as famous and as misunderstood as the giant squid. It has appeared in fictional movies and stories to the point where most people believe it doesn't exist. But rest assured, it is very real. The elusive giant squid, known to science as Architeuthis dux, is one of the world's largest animals. It is known to reach a length of up to 60 feet. It is one of the largest known invertebrates in the world and one of the largest creatures in the sea. Many believe that the terrible Kraken of ancient myth may have been based at least in part on this real life monster. The giant squid is a mollusk and is member of the cephalopod class, which includes the octopus and other squids. Very little is known about these mysterious creatures because until recently, none had been seen alive in the wild. Most of what we know about them comes from the bodies of dead squid that have washed ashore or been pulled up in fishermen's nets. A breakthrough occurred in September of 2004 when researchers from Japan managed to photograph a live squid in the wild. In 2006, the same team was able to obtain the first ever video footage of a live giant squid. This and other recent evidence suggests that these creatures may be more plentiful than previously thought. Like its other squid cousins, the giant squid's body is composed of a mantle, eight arms, and two longer tentacles. The mantle, or main body, of the squid is typically around six and a half feet (2 meters) in length. The arms and tentacles account for most of the animal's length. The inside surfaces of the arms and tentacles are lined with hundreds of suction cups, ranging in size from about one to two inches in diameter. Each suction cup is surrounded by sharp, serrated edges that help the squid hold on to its prey. The upper part of the mantle has two small fins that are used to help maneuver the animal in the water, although its main source of locomotion is jet propulsion. The squid can move through the water at high speeds by taking water into its mantle cavity and then expelling it with great force. The giant squid has a complex nervous system and a highly developed brain. They are thought to be highly intelligent, and may be one of the smartest invertbrates in the ocean. Their eyes are the among largest in the world, second only to their larger cousin, the colossal squid. These giant eyes are actually the size of an average dinner plate, nearly one foot in diameter. Large eyes are an important adaptation that helps the squid locate food in the darkness of the deep ocean. The squid probably cannot see in color, but their specialized eyes are though to be finely tuned for distinguishing differences in light levels. The giant squid is the second largest mollusc in the world and is also the second largest invertebrate. The colossal squid is the largest. 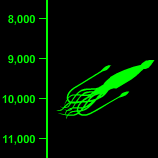 The female giant squid is much larger than the male. Females average about 43 feet (13 meters) in length. The much smaller males are believed to grow to about 33 feet (10 meters). There have been claims of specimens of up to 66 feet (20 meters), but none have been officially documented. Many researchers believe the giant squid to be a very aggressive animal. During World War II, stories from the survivors of sunken ships tell of shipmates being eaten by these creatures in the dark of night. There have even been reports of giant squid reaching out of the water and pulling men off small boats. None of these reports have been officially verified, but they do paint a picture of a powerful predator. The squid's eight long tentacles have strong suction cups, which they use to hold on to their prey. A sharp, powerful beak finishes off their helpless victim with eerie efficiency. They are thought to feed on deep sea fish and other species of squid. 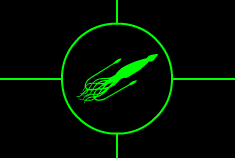 It is believed that they are solitary hunters, preferring to hunt alone in the dark waters of the deep ocean. As large and powerful as these creatures are, they are not at the top of the food chain. The giant squid has at least one natural enemy. It happens to be a favorite meal of the sperm whale. The squid are commonly found in the stomachs of dead whales. Many of these whales even bear scars from the squid's suction-cupped tentacles. The main defense mechanism of the squid is a dark, black ink, which can used to create a smoke screen. This ink can temporarily confuse predators, allowing the squid precious time to attempt their escape. Very little is known about the reproductive behavior of the giant squid. It is believed that they reach maturity at the age of three years and that the males mature at a smaller size than the females. The females lay a large number of eggs. Juveniles have been observed in the surface waters off the coast of New Zealand. Several aquariums are attempting to capture and maintain juvenile specimens in an attempt to learn more about this mysterious creature. Giant squid are found throughout all of the world's oceans. They are usually found at depths of between 1,000 feet (300 meters) and about 2,000 feet (600 meters), although there are documented reports of specimens found as deep as 3,800 feet (1175 meters). 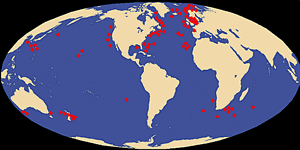 They are usually found near continental and island slopes from the North Atlantic Ocean near Newfoundland, Norway, and the British Isles, and the South Atlantic near Southern Africa. They are also found in the North Pacific Ocean near Japan, and the Southwestern Pacific near Australia and New Zealand. 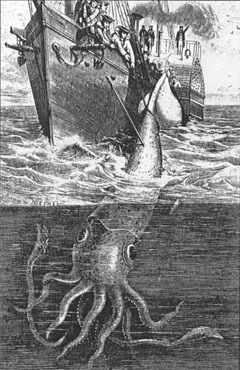 Giant Squid are rare in polar and tropical regions.